Out of the nine interior southern U.S. states, only Tennessee grew by more than 100% between 1950 and 2016. In contrast, out of the seven Southeastern U.S. states, all of them other than South Carolina grew by 150% or more between 1950 and 2016. What exactly is the reason for this discrepancy? 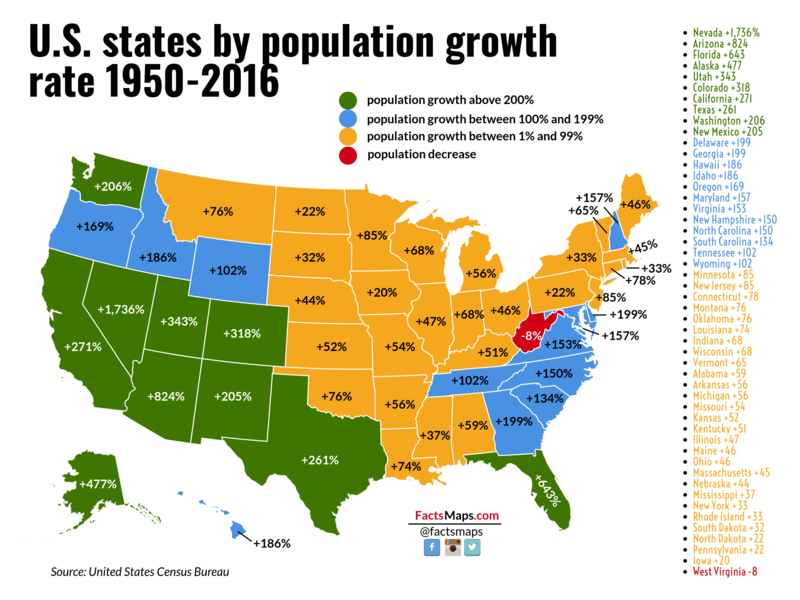 Why exactly did the Southeastern U.S. grow much faster than the interior Southern U.S. did between 1950 and 2016? *Note: I know that post-1991 events are not to be discussed on this forum. However, this trend began decades before 1991 and thus appears to be fair game for discussion on this forum. Retirees began moving to Florida in significant numbers after WWII attracted by the weather and low living costs. Other coastal southern states also benefited for the same reason. In addition a more accommodating post segregation South attracted businesses and jobs. Interior southern states and Gulf states were just less accommodating. However within states there are differences. The Atlanta area is more accommodating than rural Georgia. Eastern Virginia is much different from western Virginia which has much less growth mainly due to the former's proximity to DC. North Carolina has the "Research Triangle" around Raleigh and a major banking center in Charlotte with diverse well educated populations. Other parts of the state, not so much. A lot depends on each individual state. Northern Louisiana lost a lot of population, much of it left the state. Shreveport boomed for about 30 years then several plants closed and the people left the state. White Flight sent many to Texas eventually. Population growth in Southern Louisiana has pretty well stopped. Katrina Refugees moved to Baton Rouge and killed just about every White Public School. Now a lot of Louisianans are leaving and looking for work. The effects of Bobby Jindal's eight years is still having an effect. Jindal claimed that if he cut public spending and cut taxes Industry and Jobs would come. We are still waiting on both. His effect dried up much of the state money supply. Retirees began moving to Florida in significant numbers after WWII attracted by the weather and low living costs. Yes, but why not also move to Louisiana, southern Mississippi, and southern Alabama? I mean, if the retirees involved are White, there should be no problem settling down there even before the Civil Rights Movement. Other coastal southern states also benefited for the same reason. Louisiana, Mississippi, and Alabama all have coastlines but didn't benefit from this, though. In addition a more accommodating post segregation South attracted businesses and jobs. That's certainly true, though one would think that more southern U.S. states would have become attractive with the end of segregation. Interior southern states and Gulf states were just less accommodating. However within states there are differences. The Atlanta area is more accommodating than rural Georgia. Eastern Virginia is much different from western Virginia which has much less growth mainly due to the former's proximity to DC. North Carolina has the "Research Triangle" around Raleigh and a major banking center in Charlotte with diverse well educated populations. Other parts of the state, not so much. What exactly made Texas boom and its population skyrocket in the post-World War II decades? You mean in New Orleans? Is Louisiana's new leadership willing to do something about this? A lot of growth across the entire country has been urban growth at the expense of rural areas. States with the highest growth rates have big cities - Miami, Tampa, Jacksonville, Atlanta, Charleston, Raliegh-Durham, Washington DC, Dallas-Ft Worth, Houston, San Antonio, Memphis, Nashville. Meanwhile, Alabama, Mississippi, Arkansas, Kentucky, West Virginia have always been much more rural states. A major source of growth over the last sixty years has been the expansion of state governments. State capitals have grown much faster than other American cities. Alabama, Mississippi, Louisianna, and Arkansas have always had the strongest anti-government philosophies. Kentucky was heavily invested in several industries that have declined in popularity over the past sixty years including tobacco, whiskey, and horse racing. Florida's growth can be partly explained by almost one million Cuban immigrants since 1959. Texas since 1950 owes much of its growth to oil. More recently they've expanded their tech sector. Independent School Districts keep many rural districts White. When I was in High School, Shreveport had only two Black High Schools, but most of the Black Students were in the "White" High Schools. Now there is only one White High School, in North Caddo. The Courts have sent Black Students throughout the old School Districts. Most Louisiana School Districts are Parish wide and vulnerable to forced bussing. Katrina hit Orleans Parish worst as it was behind levees. The populations in Surrounding Parishes was hit hard, but they have recovered more. The really poor from Katrina were stuck wherever they evacuated to. Before, a poor person could live on Food Stamps and Aid to Dependent Children without a car in New Orleans. The present Governor is a Democrat in a solidly Republican state. He could be doing more, but is trying to get the GOP to help him. This will probably end badly. The Governor has Line Item Veto and if he was willing to be a one term Governor, he could get whatever he wants. He is now running for re-election. Every Legislator is willing to cut spending in every district but his/her own. The State, in my opinion needs more revenue. The more you spend (without deficit spending) the more money supply there is and more money circulating seems to circulate down. Coasts and shores versus mountains and fields. Most people prefer the former. Economically, travel and transport is also easier. I remember being in eastern Kentucky in 1986. It took over an hour to get to the small town with major marchants. The winding mountain tops were hard to traverse. Most of those moving from the Northeast and Midwest avoided states like Alabama, Mississippi and Louisiana as well as the Florida panhandle in favor of peninsula Florida. This was a boom development area in the 1920's supported by a new railroad. The boom ended with the Great Depression and war but was ready to receive new migrants by 1950. The state continues to grow mostly south of Gainesville, but also the western panhandle with its great beaches. Yes, but "Yankees" from "up north" felt less comfortable in the Deep South states. The Gulf Coast does attract more people from the Midwest in more recent times as does large cities like Atlanta for younger working people. Coastal areas are often more diverse and receptive to new residents than inland areas. If it hasn&#8217;t been said, the invention of the air conditioner helped a lot of population to move South. Very few people wanted to live in the South because of the heat. I don&#8217;t know how people lived in these areas in high summer and sleep at night. Supposedly it want as hot then but it was stealing freaking hot. The advent of air conditioning I think brought a lot of people south to seek their fortune, and really part of the rise of the so called &#8220;New South&#8221; where people from different parts of the country could settle and live there.